With Father's Day fast approaching, most of us are on the hunt for the perfect way to honor the special dads in our lives. For our family that dad, is my husband. When my husband and I met (all those years ago!) I don't think that I could have ever imagined the kind of dad he would become. What I did know at the time was that he was kind to his family, and an amazing son to his mom. Fast forward 16 years and 3 children (+1 on the way) later, and today, I'm most taken back by his patience with others. It literally seems as though he has never ending amounts of patience some days! Because he also works with children as a therapist, its a skill that he's honed well. He isn't easily angered, and in-turn, he's able to teach and guide our children in a way that really resonates. He's a great dad, and I don't know what we'd do without him. He's our hero! Read on and grab your free Father's Day printable + enter to WIN 1 of 4 one year memberships to BJ's Wholesale Club, below. Because he spends so much time showing others how much he cares, we want to show him how much we care and appreciate him, this Father's Day. 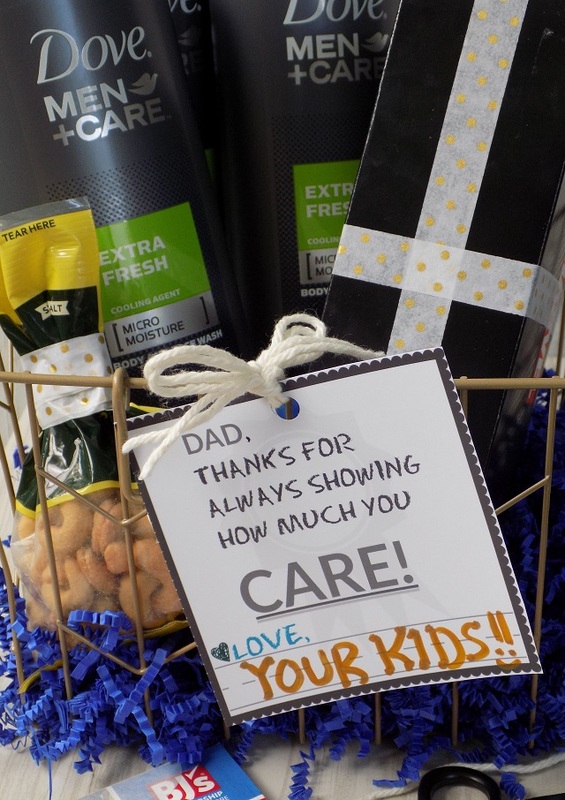 The kids and I rounded up a few of his favorite snacks, along with a fun gift and some new personal care items from the Dove Men + Care line. We bundled everything together in a special Father's Day care package so that he can kick back, relax and rejuvenate on his special day. This care package was super simple to put together. Instead of stopping at several stores, I was able to grab everything that I needed at our local BJ's wholesale club when I stopped for groceries. While we already find great deals and savings at BJ's, they also had additional coupon savings on Dove Men + Care products this month. Really, who doesn't love a great deal? 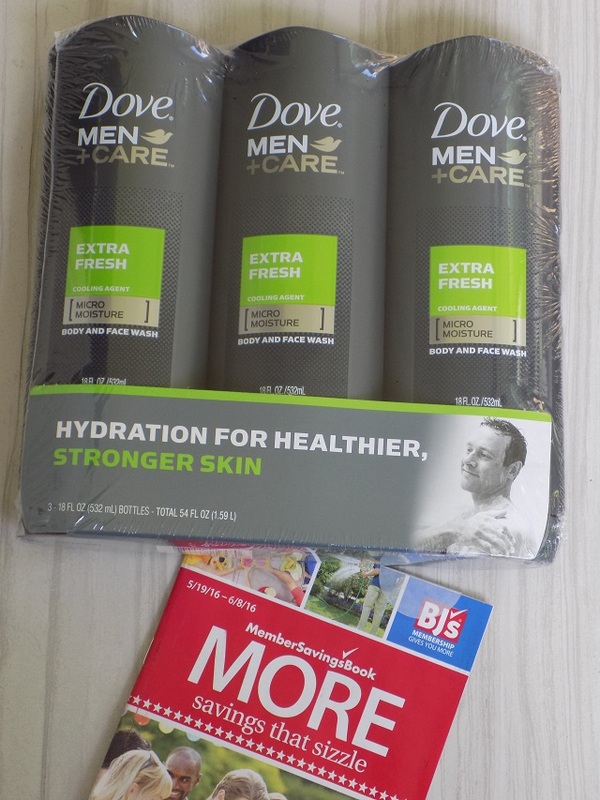 The 3 pack of Dove Men + Care Face and Body Wash was the perfect addition to our care package. Once we had everything we needed, we packed it all into the basket, then finished it off by tying a fun gift tag to the front (with a signature line for the kids to sign their names). You can grab the free printable care package tag at the bottom of this post - simply right click to save/print the image (it's sized to print as a 5"x7" - be sure to adjust your printers settings accordingly). The kids and I think that this care package is a great way to show our hero how much we love and care, this Father's Day! Ready to put together your own Father's Day care package for the amazing dads in your life? 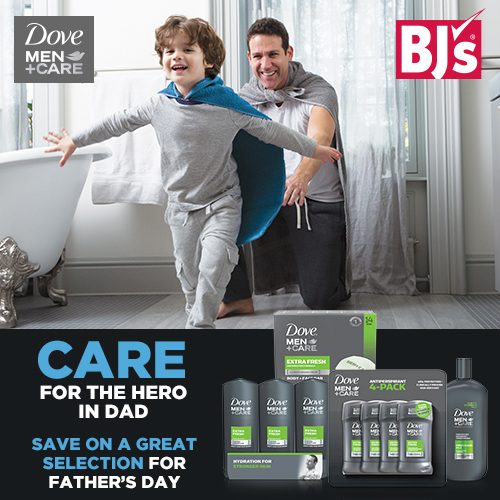 Head to BJ's Wholesale for great deals on Dove Men + Care personal care products to add to your basket - so dad can pamper himself a bit this Father's Day (and every day!). Happy Father's Day to all of the dads out there! I hope you all have a great day - you deserve it! FREE PRINTABLE FATHER'S DAY CARE PACKAGE TAG PRINT INSTRUCTIONS: Right click on the image above to save/print ( note: it's sized to print as a 5"x7" - be sure to adjust your printers settings accordingly ).